We often say that we’re blessed to live in Bangor, and it’s true! Maine is a unique place, and some of the best folks we know call it home, including the men and women of the Bangor Police Department and the Penobscot County Sheriff’s Office. 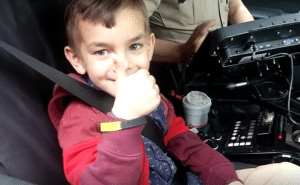 Yesterday, Officer Dan as he is known, helped make a wish come true for our pal, Liam! And, a huge thank you to Brian Sullivan and our friends from WABI for capturing the moment! Previous post: Our New Logo… What Is It?